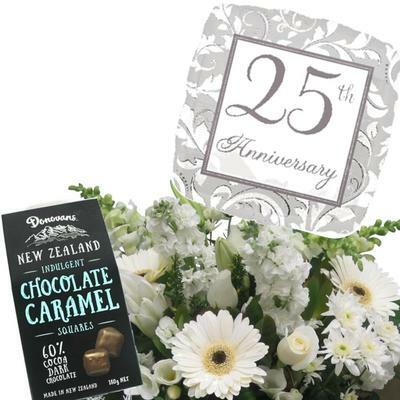 Wedding Anniversary Gifts | Best Blooms Florists | Delivery Flowers Auckland N.Z. Wow thanks for this, what great service too, the bouquet arrived the same day and I had put the order in at 2.30! Wedding Anniversary Gifts with FREE Delivery in Auckland. Anniversary gift ideas from romantic roses, beautiful flower bouquets, anniversary gift baskets for couples to share, or Celebrate with a Golden Anniversary Table Centrepiece. There are even Happy Anniversary Balloons! Golden Wedding Anniversary flowers, silver anniversary presents, ruby weddings, diamond wedding anniversaries. These are such special, momentous days to share and celebrate with the family. Ask our florists to design a special floral arrangement to commemorate the day! >>Blog Post: Full list of Traditional Wedding Anniversary Gifts by Year. If you prefer to order by phone, please call our team of professional florists on 09 838 9058.